The Ruddy Turnstone (Arenaria interpres) is a small wading bird, one of two species of turnstone in the genus Arenaria. It is now classified in the sandpiper family Scolopacidae but was formerly sometimes placed in the plover family Charadriidae. It is a highly migratory bird, breeding in northern parts of Eurasia and North America and flying south to winter on coastlines almost worldwide. It is the only species of turnstone in much of its range and is often known simply as Turnstone. It is a fairly small and stocky bird, 22–24 centimetres (8.7–9.4 in) long with a wingspan of 50–57 centimetres (20–22 in) and a weight of 85-150 grams. The dark, wedge-shaped bill is 2–2.5 centimetres (0.79–0.98 in) long and slightly upturned. The legs are fairly short at 3.5 centimetres (1.4 in) and are bright orange. At all seasons, the plumage is dominated by a harlequin-like pattern of black and white. Breeding birds have reddish-brown upper parts with black markings. The head is mainly white with black streaks on the crown and a black pattern on the face. The breast is mainly black apart from a white patch on the sides. The rest of the underparts are white. In flight it reveals a white wingbar, white patch near the base of the wing and white lower back, rump and tail with dark bands on the uppertail-coverts and near the tip of the tail. The female is slightly duller than the male and has a browner head with more streaking. Non-breeding adults are duller than breeding birds and have dark grey-brown upperparts with black mottling and a dark head with little white. Juvenile birds have a pale brown head and pale fringes to the upperpart feathers creating a scaly impression. Birds of the subspecies morinella are smaller with darker upperparts and less streaking on the crown. The Ruddy Turnstone has a staccato, rattling call and also a chattering alarm-call which is mainly given during the breeding season. It breeds in northern latitudes, usually no more than a few kilometres from the sea. The subspecies A. i. morinella occurs in northern Alaska and in Arctic Canada as far east as Baffin Island. A. i. interpres breeds in western Alaska, Ellesmere Island, Greenland, Norway, Denmark, Sweden , Finland, Estonia and northern Russia. It formerly bred on the Baltic coast of Germany and has possibly bred in Scotland and the Faroe Islands. In the Americas, the species winters on coastlines from Washington and Massachusetts southwards to the southern tip of South America although it is scarce in southern parts of Chile and Argentina and is only an unconfirmed vagrant in the Falkland Islands. In Europe it winters in western regions from Iceland, Norway and Denmark southwards. Only small numbers are found on Mediterranean coasts. In Africa it is common all the way down to South Africa with good numbers on many offshore islands. In Asia it is widespread in the south with birds wintering as far north as southern China and Japan (mainly in the Ryukyu Islands). It occurs south to Tasmania and New Zealand and is present on many Pacific islands. Some non-breeding birds remain year round in many parts of the wintering range, with some of those birds still taking on breeding plumage in the spring and summer. It can survive in a wide range of habitats and climatic conditions from Arctic to tropical. The typical breeding habitat is open tundra with water nearby. Outside the breeding reason, it is found along coasts, particularly on rocky or stony shores. It is often found on man-made structures such as breakwaters and jetties. It may venture onto open grassy areas near the coast. Small numbers sometimes turn up on inland wetlands, especially during the spring and autumn migrations. Birds are often faithful to particular sites, returning there year after year. Ruddy Turnstones are fairly long-lived birds with a low annual mortality rate. They are able to breed when two years old. Their average lifespan is 9 years with 19 years and 2 months being the longest recorded. 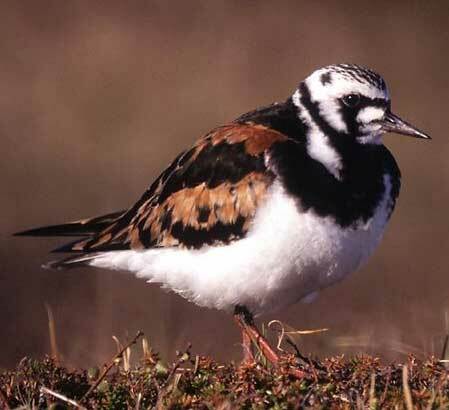 The Ruddy Turnstone has a varied diet including carrion, eggs and plant material but it feeds mainly on invertebrates. Insects are particularly important in the breeding season. At other times it also takes crustaceans, molluscs and worms. 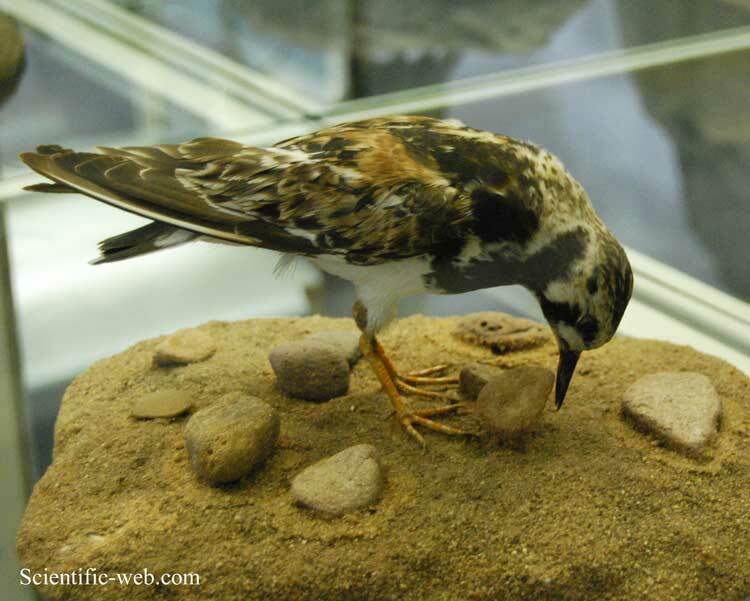 It often flips over stones and other objects to get at prey items hiding underneath; this behaviour is the origin of the name "turnstone". It usually forages in flocks. It is a monogamous bird and pairs may remain together for more than one breeding season. The nest is a shallow scrape, often with a lining of leaves. It is about 11 centimetres across and 3 centimetres deep. It may be built amongst vegetation or on bare stony or rocky ground. Several pairs may nest close together. A single clutch of two to five eggs is laid with four being most common. The eggs measure about 41 millimetres by 29 and weigh around 17.9 grams. They are smooth, slightly glossy and oval to pear-shaped. They are variable in colour but are commonly pale green-brown with dark brown markings, densest at the larger end. Incubation begins when the first egg is laid and lasts for about 22–24 days. The female is mainly responsible for incubating the eggs but the male may help towards the end. The young birds are precocial and are able to leave the nest soon after hatching. They are buff above with dark grey markings and are white below. They are able to feed themselves but are protected by the parents, particularly the male. They fledge after 19–21 days. * Harrison, Colin (1975) A Field Guide to the Nests, Eggs and Nestlings of British and European Birds. Collins, London. * Robinson, R.A. (2005) BirdFacts: profiles of birds occurring in Britain & Ireland (v1.1, Jan 2006). BTO Research Report 407, BTO, Thetford (http://www.bto.org/birdfacts). * Rosair, David & Cottridge, David (1995) Hamlyn Photographic Guide to the Waders of the World. Hamlyn, London. * Snow, D. W. & Perrins, C. M. (1998) Birds of the Western Palearctic: Concise Edition Vol. 1. Oxford University Press, Oxford.